Researchers have developed a new strategy that aims to automate the design of soft robots. 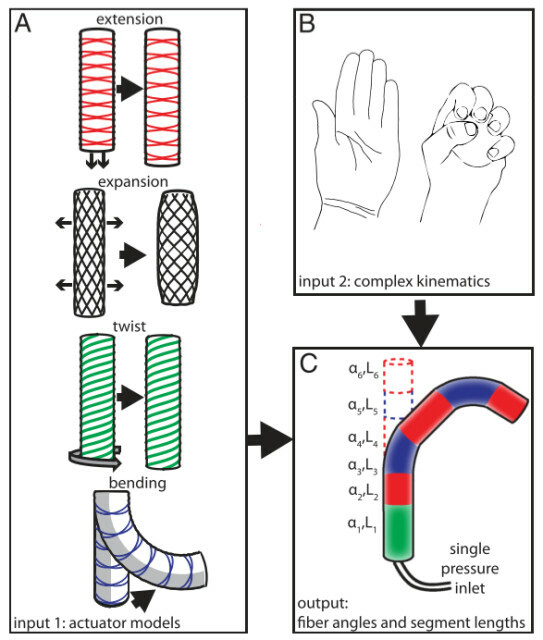 The approach uses mathematical modelling to design for a specified trajectory of movement, such as a robot that mimics the bending of a human finger. The actuators used to create the soft robots are fluid-powered, fiber-reinforced actuators that can replicate a wide range of movements. Although many types of movements are possible, designing the actuators to output these movements isn’t a trivial task. There are four different actuator motions Connolly is referring to: extension, expansion, twisting, and bending. By combining different types of actuator segments, you can achieve a much more complex movement than any individual segment could offer on its own. The researchers created analytical models of the four different motion types. Using these, they created a design tool that takes as input the kinematics of the desired motion, and outputs the optimal segment lengths and fiber angles to replicate the motion. 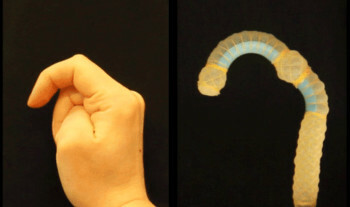 Using their model, the researchers designed two soft robots: one that bends like an index finger, and another that twists like a thumb. Both robots are powered by a single pressure source. You can read the team’s research paper here. The new methodology will be included in the Soft Robotic Toolkit, an open-source online resource developed to assist researchers, educators and hobbyists to design, fabricate, model, characterize and control their own soft robots. For more soft robotics news, read How Robots Can Feel with Optical Waveguides.